N/Ar sensitive but tough erosion control, BioNet erosion control blankets are made of straw, straw/coconut or coconut fibers stitched into or between full biodegradable nettings of jute yarn. They are completely biodegradable, therefore no synthetic netting residue is left on the site after vegetation grow-in. The woven construction is also designed to lessen the chance of accidental wildlife entrapment. The blanket's flexibility and moisture control absorption help it conform to the soil surface. Applications include seed bed protection and erosion control in moderate to severe slopes and low to high flow channels. 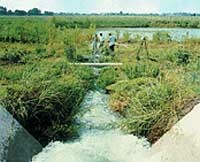 The system features nettings woven using "Leno" weaving, said to improve stability under severe conditions by intertwining and securing the netting machine and cross-direction strands.